Winter can be a bland time in the garden. Most plants are dormant or green and your outdoor spaces can be drab. In Arizona, many days are still nice enough to spend outside. And, you can make your yard more cheery by adding some color. It doesn’t take much room to make a statement. A small planter or a few outdoor pots can create an impact. Here are some flowers that are readily available and will add color to your winter landscape. Marigolds – They can be orange or yellow and grow 15″ to 18″. They don’t require much water and they attract butterflies. They will bloom from December through May. They can take the full sun. Geraniums – These can be orange, red, purple, yellow, pink or white. They grow 12″ to 18″ tall. They require a lot of water but are easy to grow. They like partial shade.They can bloom into June. 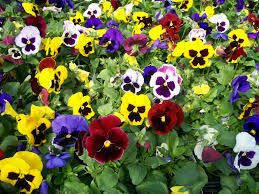 Pansies – The colors for pansies are blue, yellow, orange, purple, white, red and pink. They become 6″ to 12″ tall. They like some sun. And,they are edible. They bloom through April and are easy to grow. 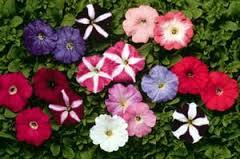 Petunias – Petunias are blue, yellow, pink, purple and white.They grow from 6″ to 18″ tall. Petunias have a nice fragrance and are easy to grow. They do require a lot of water. They also attract butterflies. You can plant them now and they bloom in March, April and part of May.They do have the possibility of freezing if the weather gets too cold. Snapdragons – These can be pink, purple, yellow, red or white. They grow f rom 6″ to 36″ tall. These work well in the back or center of an arrangement. These take a moderate amount of water and like the sun. They can bloom into April or May. 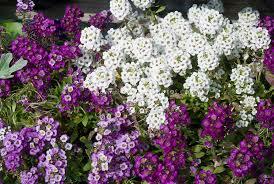 Sweet Alyssum – Alyssum comes in white, blue or pink. It makes a good border plant because it is so short. They have a nice fragrance. These do require a lot of water but are also easy to grow. They will bloom through April or May. Use a good mulch and fertilizer when planting these winter flowers. And, remember to cover them if there is a chance of freezing. Keep your soil a little moist but not wet or too dry . Call us at (520) 370-5697 if Sonoran Oasis Landscaping can help you with your plantings needs.